While it was getting ready for release, Junglee hardly carried any buzz or hype around it. After watching the film you get to know why. The film, at best, is an ordinary affair and just doesn’t entertain you thoroughly in its two hour narrative. 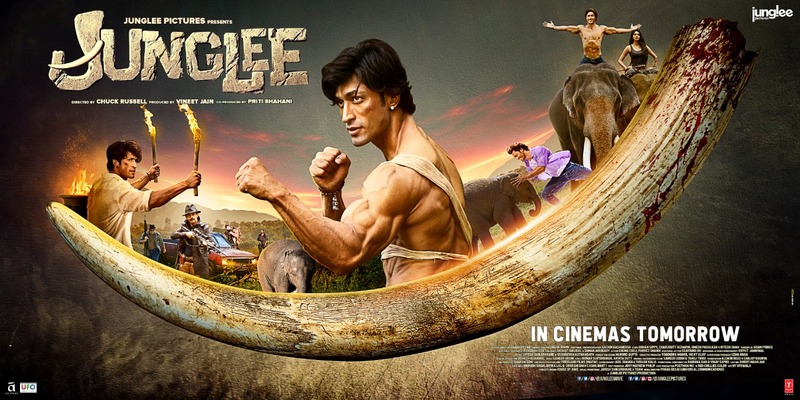 Touted to be an adventure with elephants as the center of attraction, the Vidyut Jammwal starrer had good scope to introduce a new genre in Bollywood. Sadly, this won’t really be the case if the end result of Junglee is any indication. What you miss is some cohesive story telling. Even though director Chuck Russel has done some impressive work out there in Hollywood, when it comes to his Bollywood stint here then he doesn’t quite succeed with Junglee! He tries to amalgamate the ethos of Bollywood with a style of Hollywood but the balance is hardly there. As a matter of fact it all turns out to be a bit muzzled up and you don’t really get those clap worthy moments that could have made Junglee a true entertainer. Vidyut tries hard though. He is fantastic yet again in the action sequences and pretty much continues with his Commando and Commando 2 stunts. It all comes pretty naturally to him and this time around since he is in a jungle setting, there is some kind of novelty factor that comes in too. However beyond that the stage and setting doesn’t allow him to offer something new. The locations work well and have that big screen feel to them. There is a large part of the film which has been shot outdoors and that adds on to the cinematic feel. Cinematography accentuates the visual appeal as well. That said, all technical aspects can help a film only if the story itself has weight to it and storytelling is impressive. Since that’s not quite the case here, Junglee just about passes muster. Yes, at the end of it all there is a message about wild life preservation and how animal poaching is a strict no-no. However, what you had bargained for was a good theatrical experience which ensures good entertainment and since that slips through the gaps, you don’t quite get a wholesome experience.